There’s a reason why carbon monoxide is considered a silent killer. It is odorless and colorless, meaning many people have no idea that it is present in the air. On the other hand, it’s also lethal. Enclosed spaces like homes and garages are especially susceptible to the dangers of carbon monoxide. That’s because, over time, carbon monoxide can build up in a home. Cars left running in garages and malfunctioning HVAC systems can all add carbon monoxide to the air in a home. According to the Centers for Disease Control and Prevention (CDC), between the years 1999 and 2010, over 5,000 people died in the United States from accidental carbon-monoxide poisoning in their homes. That’s an average of almost 500 people per year. Much more must be done to prevent carbon-monoxide poisoning in this country. This guide will explore what you need to know to avert tragedy in your own home. How Do I Know If I Have a Carbon-Monoxide Issue? It’s hard to tell if you have a carbon-monoxide issue without proper testing equipment. Too many people don’t uncover the problem until it’s too late. Even the symptoms of carbon-monoxide poisoning are easily misinterpreted. Here are two important tips to follow as you work to avoid carbon-monoxide poisoning in your home. Unfortunately, symptoms of carbon-monoxide poisoning are like those of the flu. Many people who are suffering from accidental carbon-monoxide poisoning don’t act because they assume they are fighting off a virus. Symptoms include dizziness, vomiting, chest pain, muscle weakness, headache, upset stomach and confusion. Those who are either sleeping or under the influence of alcohol may suffer a fatal poisoning before they notice any symptoms. You should never rely on medical diagnosis as a means of testing for carbon monoxide. Many who suffer a fatal poisoning never experience symptoms before passing away. The only reliable way to test for carbon-monoxide build-up in your home is to install a carbon-monoxide detector. Like a smoke detector, this device will sound an alarm if carbon-monoxide levels reach a dangerous point. You must change the batteries of a carbon-monoxide detector as regularly as you would for a smoke detector. It’s a good idea to change them when you adjust your clocks in the spring and fall. You should also replace the entire detector every five years. Consider investing in a detector with a digital readout, which will allow you to see if a non-lethal amount of carbon monoxide is present in your home. If you see the number rising, you can act and prevent a more serious issue. What Can I Do to Prevent Carbon-Monoxide Build-Up in the First Place? While detection is important and should be a priority for every family, the best way to prevent carbon monoxide is to prevent its release into your home in the first place. Here are five common ways to keep carbon monoxide from affecting your home. Never use a charcoal grill inside, even in a garage with the door open. The rest of your structure can capture dangerous levels of carbon monoxide. You should also avoid using your grill under an awning. While much of the carbon monoxide produced by the grill will be released harmlessly, the awning can capture enough to become dangerous. The carbon monoxide could enter your home, as homeowners commonly place awnings over doors and other home entrances. The garage is an especially dangerous place for carbon-monoxide build-up. It is enclosed and used to store a wide variety of gas-powered engines. We often park our cars, weed whackers and even generators there. For the sake of convenience, many people will start their small gas-powered appliances in the garage before taking them outside for use. However, doing so is a dangerous practice. Many small motors do not have all the safety measures that a car’s exhaust system has. As a result, even though some motors are smaller than those in cars, they can produce a lot more carbon monoxide in a short period of time. While a minute or two of use may not create a lethal amount, over time, carbon monoxide can build up to dangerous levels. Generators are one of the most common culprits for carbon-monoxide poisoning because they are most often used by homeowners who have lost power during a weather event. To avoid going into deep snow or hurricane conditions, homeowners opt instead to run a generator in a garage or on a screened-in porch — an extremely dangerous decision. Generators should always be installed or used outside, ideally downwind and at some distance from the home. If you regularly rely on a generator, you should invest in battery-powered carbon-monoxide detectors. Because of the higher risk associated with generators, having extra detection is a good idea. When used properly, a fireplace or wood stove should not cause any problems. Carbon monoxide produced by burning wood escapes up the chimney along with the smoke from the wood. 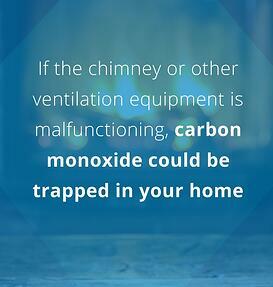 However, if the chimney or other ventilation equipment is malfunctioning, carbon monoxide could be trapped in your home. That’s why you need to get your fireplace, chimney or wood stove inspected every year before you start using it for the cold season. Natural gas used in gas appliances has an additive that gives it a distinct odor — a safety feature that informs a homeowner if there is a gas leak. However, a gas appliance can also be leaking carbon monoxide, even if you do not smell the distinct gas-leak odor. For protection, you should have these appliances inspected regularly. You want to hire someone to regularly inspect ventilation systems, as an unseen blockage could lead to a carbon-monoxide leak in your home. If you are having heating issues in your home, never use a gas range as a backup heat source. Running your gas range without cooking for an extended period can generate a lethal amount of carbon monoxide. Should I Be Worried About My HVAC System? Unfortunately, there is a significant risk of undetected carbon-monoxide from HVAC-system malfunction. While modern systems include safety features designed to prevent accidents, it’s crucial to be aware of the risk factors so you can take efforts to keep your system in proper working order. Below are three specific tips to help you maintain your HVAC system and prevent accidental carbon-monoxide poisoning. 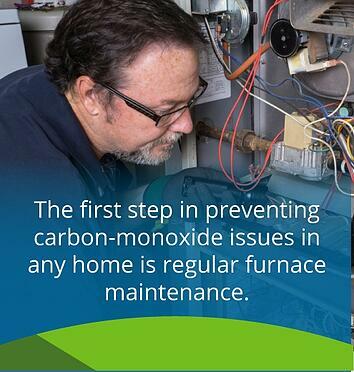 The first step in preventing carbon-monoxide issues in any home is regular furnace maintenance. HVAC technicians start their maintenance routine with an inspection, during which they pay attention to carbon-monoxide risks. The mechanisms that burn either oil or natural gas to produce heat have essential ventilation systems. If these systems have problems, carbon monoxide may be entering your home. The technician will inspect ventilation as a part of routine maintenance. You want to make sure that the technician is also specifically inspecting the heat exchanger, a portion of the furnace particularly prone to carbon-monoxide leaks. If the regular maintenance contract does not include a heat-exchanger inspection, insist on an addition. Today’s oil furnaces burn cleaner than older versions. In fact, oil-burning furnaces naturally produce less carbon monoxide than their natural-gas-powered counterparts. However, the build-up of soot and other residues from oil burning can increase your risk of carbon-monoxide poisoning since build-ups prevent proper ventilation. Additionally, older homes with oil furnaces may rely on natural draft for ventilation. The process uses negative pressure between the temperature in a home and the temperature outside to pull exhaust gases up a chimney. However, several factors — such as leaks in the chimney — can hinder negative pressure, which can also lead to carbon-monoxide build-up. If you have an oil burning furnace, especially an older one, make sure to contact an HVAC professional to inspect your system and make recommendations about the best approach for preventing carbon-monoxide issues. Naturally, gas-burning furnaces create carbon monoxide. However, they are designed with leak prevention in mind. It is imperative that leak-prevention measures function properly. Even if you have your gas furnace inspected regularly, a malfunction can unexpectedly cause an issue in your home. One sign that safety features may not be properly working is a drop in furnace efficiency. If there is a clog or a malfunctioning part, you may find that the rest of your furnace is not working as well as it usually does. What If I Know I Have a Carbon-Monoxide Leak? Open all windows and doors: The first thing you should do is increase ventilation in your home. You need to get the carbon monoxide out of the house. Open every window and door that you can to get more air circulating through your home and start to remove the carbon monoxide. Turn off gas appliances and the furnace: If you know how to turn off your furnace and gas appliances, do so immediately. One of these devices is most likely the culprit. However, it’s more important that you rapidly get out of the house and away from the carbon monoxide, so only complete this task if you’re confident you can do it quickly. Evacuate the building: At the first sign of a problem, you should have children and seniors, who are more at-risk for poisoning, evacuate the building. Once you have opened the windows and doors and shut off appliances, exit the building as well. Make sure you bring a mobile phone with you as you evacuate, as you will need it to coordinate further steps. Call the fire department: The fire department is the best-prepared first responder for dealing with carbon-monoxide leaks. Additionally, carbon-monoxide leaks could be a symptom of a larger gas leak, which could also be a fire hazard. The fire department will be able to diagnose any additional risks. Seek medical attention: If anyone in your family is suffering symptoms that might be attributable to carbon-monoxide poisoning, they should receive medical attention directly. However, symptoms may take a while to appear, so it’s a good idea for everyone who has been exposed to receive medical care. Contact an HVAC expert to handle the issue: While the fire department will make sure your home is secure, they won’t complete the kind of inspection you’ll need to determine the exact source of the problem, nor will they take necessary steps to fix it. This is where a professional HVAC expert comes in. Once the scene has been stabilized, an HVAC expert will do a thorough inspection to uncover the issue and fix it, allowing you to re-enter your home with the confidence that you will not risk further exposure to carbon monoxide. Who Do I Contact If I Need an HVAC Expert? If you live Connecticut, Delaware, Maine, Massachusetts, New Jersey, New York, Maryland, Pennsylvania, Rhode Island or New Hampshire, your best choice for an HVAC expert is Smart Touch Energy. Although the company started as a means of providing affordable heating oil with less hassle, our services have expanded. Our HVAC experts are trained to address the kinds of issues that can lead to carbon-monoxide leaks before they even begin. If you do find yourself with a carbon-monoxide leak, our technicians will get the issue fixed as quickly as possible. If you have an oil-burning furnace, regular cleaning is essential for preventing soot build-up that can otherwise lead to carbon-monoxide issues. We provide oil burner cleaning services, which will ensure that ventilation in your home is working properly. Not only will this make your home safer, but it will also help your oil-burning furnace work at peak efficiency throughout the winter season. Even if you don’t have carbon-monoxide problems, Smart Touch Energy is here to provide affordable, conveniently delivered heating oil. We also offer emergency deliveries for those that find themselves out of oil at an inopportune time. If you have any further questions about carbon monoxide or heating oil, need to purchase heating oil at an affordable price point or want to schedule routine maintenance or emergency services, contact us today!